You wouldn’t use a push mower to mow a large property, so why would you use a small two-stroke blower to remove leaves and debris? 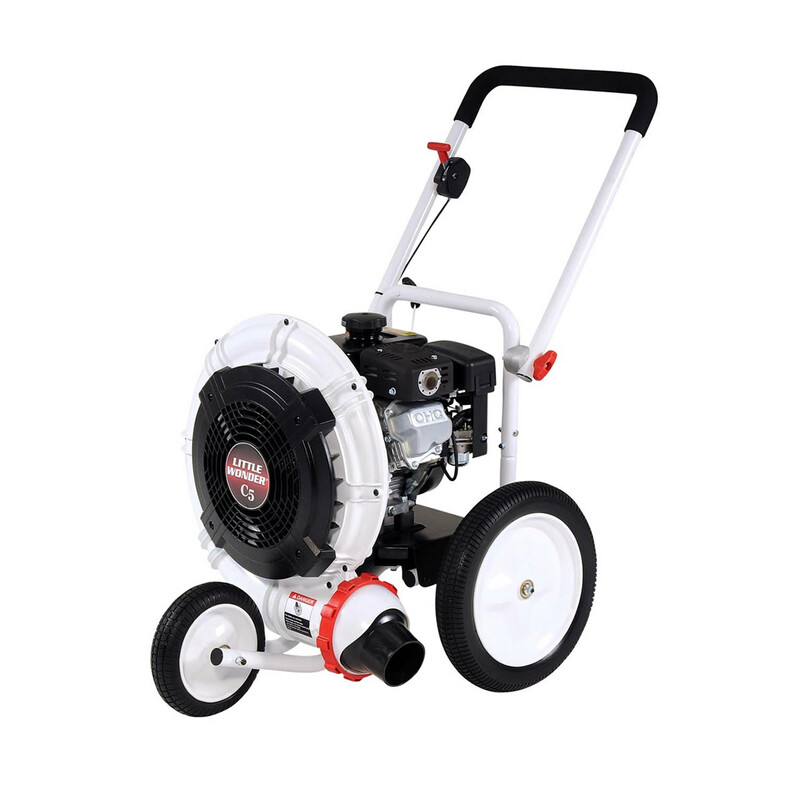 Little Wonder’s C5 walk-behind blower is small enough to be practical for homeowners, but it comes with the power and features of a professional model. With four times the power of a backpack blower, it turns big cleanup jobs into small ones. Little Wonder equips this blower with a 5.7 hp Subaru SP 170. Although aimed at the consumer and light commercial market, it still has most of the features that have made their EX Series a mainstay in commercial outdoor equipment. Its overhead cam design reduces the number of engine components, making this engine quieter, smoother and more efficient than overhead valve engines. This design also increases the engine’s surface area for better cooling, increasing engine life. The engine drives a 16-inch composite fan mounted in a composite housing. By casting these pieces out of plastic, Little Wonder is able to get extremely close tolerances that would be impossible with a metal design. By eliminating gaps and dead spaces, this blower is able to move more air, makes less noise and produce less vibration. Low weight and smoother flow also takes the strain off of the crankshaft, resulting in longer engine life. This model can move up to 1,100 cubic feet per minute, while an air velocity of 200 mph gives the blower the power to lift matted, wet leaves. Together, this gives the C5 four times the power of the most powerful backpack blower. Air exits the fan housing via a 3.5-inch wide Aim Rite discharge nozzle. This nozzle offers tool-free adjustment to change air direction during use: move the nozzle down to skim the surface and pull up wet leaves, raise it to get wide coverage or tilt it forward to blow leaves away from curbs and buildings. The blower rides on flat-free tires mounted on wheels with ball bearings, cutting out maintenance and making it easy to push. A 10-inch wheel up front and 16-inch wheels at the rear give it the same stability on rough terrain as a high wheel push mower. At 102 lbs, this blower weighs less than many walk-behind mowers. A thick, padded 1 ¼ inch steel tube handle reduces vibrations and hand stress, making it comfortable for long jobs. Once the work is done, the handle folds down for storage and transport. Little Wonder covers the C5 for two years of residential use or 90 days of commercial use. Subaru guarantees the SP 170 for three years of residential use or one year of commercial use. Is the C5 just what you need to take care of your lawn? Do you need parts or service for your other Little Wonder equipment? Shank’s Lawn Equipment can help. We’re a certified dealer for most outdoor equipment manufacturers including Little Wonder and Subaru Power. Stop by our shop at 4900 Molly Pitcher Highway in Chambersburg, PA. That’s one mile East of I-81 from Exit 10. Need parts for your walk behind blower? We ship parts and accessories across the U.S. and Canada. To order, visit www.shankslawn.com. This entry was posted in Uncategorized and tagged Little Wonder Blower, Little Wonder C5 Blower, Shank's Lawn. Bookmark the permalink.